I have some shocking news - I haven't gotten the chance to see Man of Steel yet. I'm even more shocked than you, but I swear I'm doing my best to find a time when I can get to the theater. Until then, I have to be satiated by reading my friends comments and buying the toys. 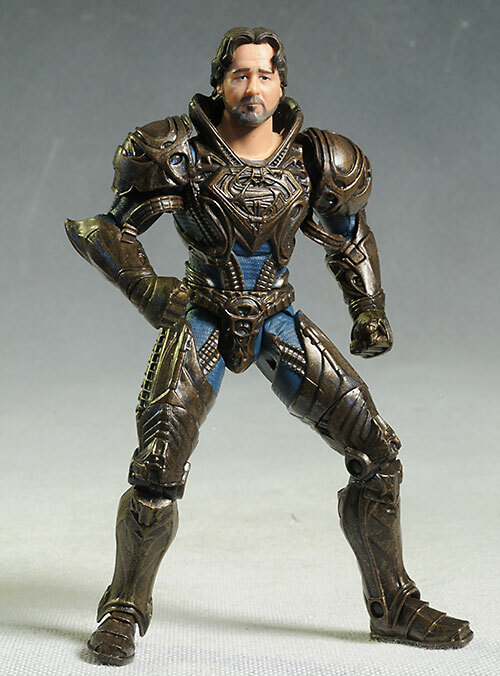 I found the Jor-El Movie Masters figure, the final figure in the first wave, and I'm covering him tonight. 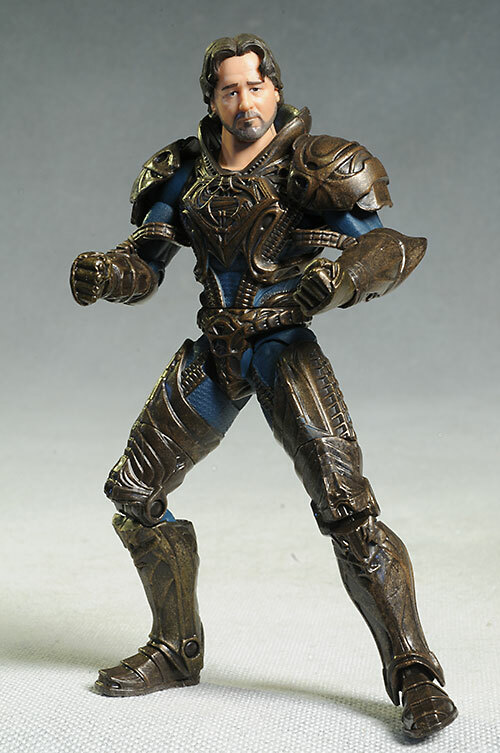 I have also seen several of the others, including the very cool armored Zod, but have yet to find Faora. When I do, another review will be coming. You can find these at your local store for around $16 or so, depending on the retailer. It's over sized packaging at its worst, but if you're not particularly green or particularly concerned, then that's a minor nit. There's no accessories taking up all that space, but at least the graphics are well done with some reasonable character personalization on the front and back. 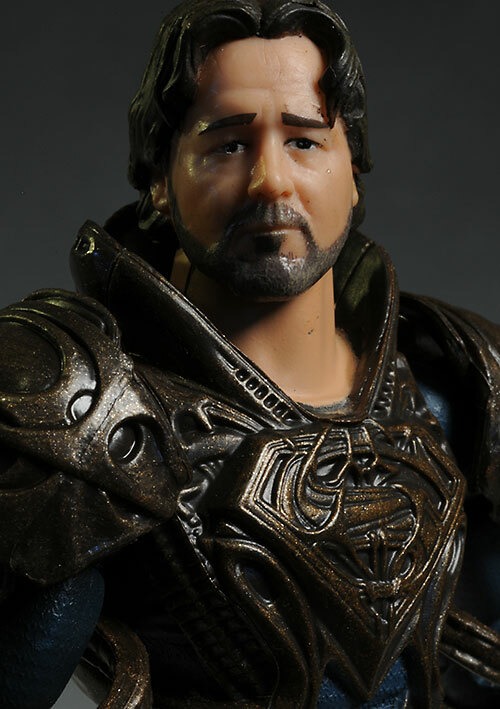 This is a very good looking Russell Crowe sculpt, even if he does look about 10 years younger (at least) than he actually is. The shape of the nose, the rounded cheeks and jawline, and forehead and hair all contribute positively to the likeness. 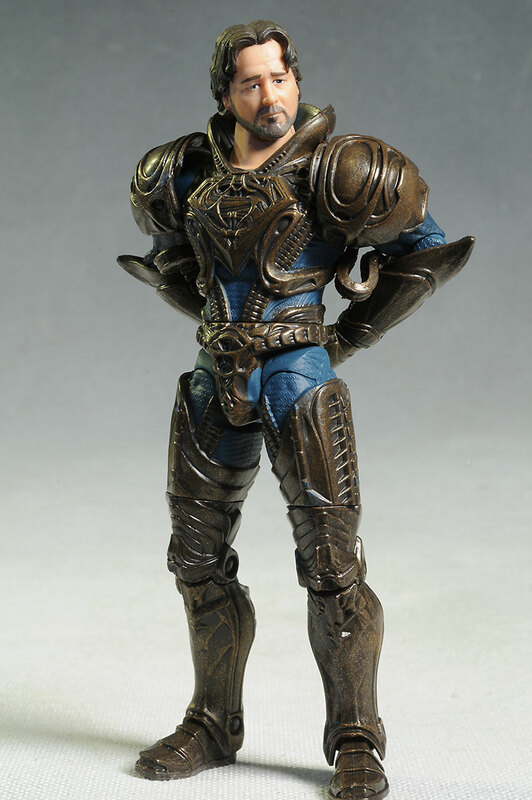 The armor is very detailed, and very sharply defined. Considering the scale - he's only 6 1/4" tall - the amount of detail is pretty impressive. 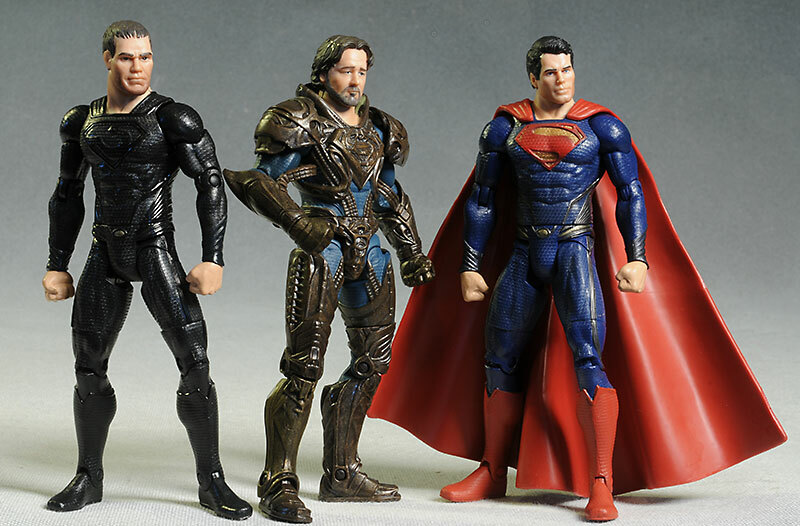 He fits in nicely, scale-wise, with the Superman and Zod, making for a great looking display. The hands are done in solid fists, so there's no holding any accessories. Then again, there's no accessories to hold, so that was probably the best choice for the pose. The overall look is very clean, and there's enough paint ops to justify the cost. The beard is a grayer color than the hair, but I suppose trying to get the more salt and pepper look with both was a bit much to ask. The real key to the Crowe look is those eyebrows, tilted down in a forever pinched expression. They are a little caterpillar-y, but that's only noticeable in macro photos - in person, it looks pretty spot on. The armor has a nice, metallic finish that gives it some substance. It definitely looks protective and solid, not merely decorative. All the usual joints are here, at least for a current Movie Masters figure. There's a terrific ball jointed neck that allows for lots of tilting and leaning, giving every pose more personality and realism. There's ball jointed shoulders, cut biceps, wrists, waist, and thighs, pin elbows, knees, and ankles, and of course, hinge hips. There's no ab-crunch, but that's a joint that wouldn't do much with all that armor in the way. Jor-El can take good poses, with natural flow. Mattel can do articulation right in this scale...when they want to. Unfortunately, this is the one area where this figure really falls off. There's only the small display base included. It's unique to this character in style (so far), but you don't really need it...and I'm sure there's plenty of potential extras in the film they could have included instead. Even without any accessories, these are still solid toys. 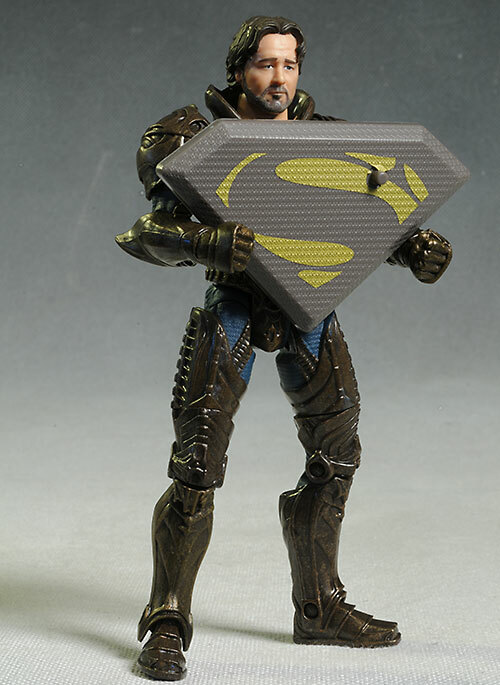 The conflict between Zod, Superman, Jor-El and the others allow for all kinds of play potential, and the articulation, sculpts and paint are high enough quality to make kids happy. Unlike the previous two figures I picked up, I snagged this guy for about $16. That's a pretty average price, but the total lack of interesting accessories causes this value to drop as well. So far so good with this Movie Masters line. I'm happy with the releases, and getting several different characters so early is nice. We'll be swamped by Superman and Zod variants soon enough, but we know we're getting at least four unique characters too. 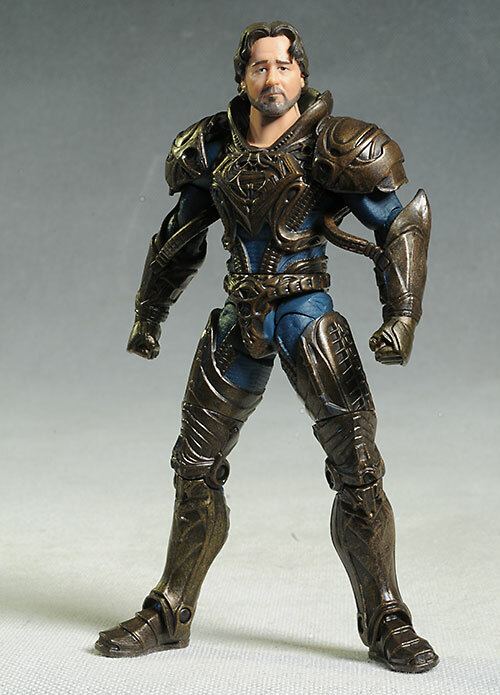 For the line in general, a BAF would have gone a long way to make the lack of other accessories a bit more palatable, but it's a minor nit to pick. The quality of the sculpts, paint and articulation are all top notch, and while these are intended for 'collectors', there's no reason kids won't have a terrific time re-enacting the battles from the screen. These aren't Hot Toys figures of course, but they are a very nice alternative for folks (and kids) with more realistic spending habits. Your best bet is the local mass market store, in particular Meijer, Toys R Us or Walmart. Expect to pay around $16. 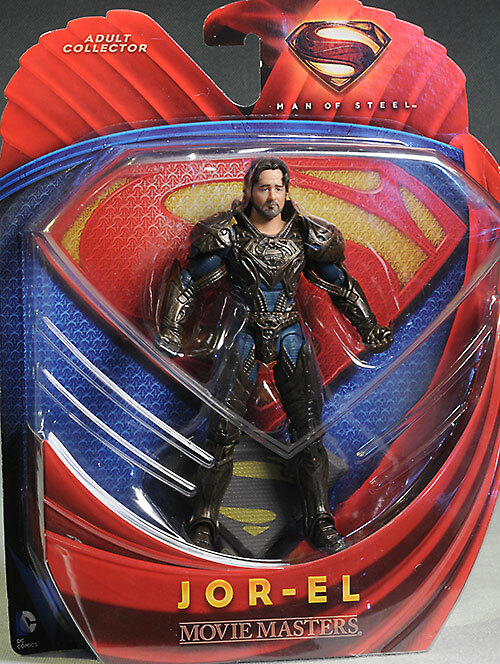 I've already checked out the basic Superman and General Zod figures, and will be looking at some more as they are released.